Doesn't appear to matter if it is a browser playback or Android TV. Doesn't appear to be load related. Happens with just one stream or multiple streams. Doesn't appear to be channel specific. Video quality/Stream rates doesn't appear to be a factor. When it happens it tends to, but not always, affect all active streams. Had TV running in the living room and my office. Can hear the TV in the living room from my office. When my office stream dropped, so did the living room on a couple occasions. Browser versions (Chrome or Firefox) doesn't make a difference. When the steam stops the connection to the HDHomeRun tuner is released. Streaming the channel in VLC directly from the HDHomeRun device doesn't pause or drop. Tested from workstations and the Emby server. Can't say exactly when this started happening but if I had to guess I'd say it was in the last 4/5 betas ago. Not saying Emby is at fault. Just to get a timing. I'm pretty good about applying updates withing 24-48 hours of them being pulled to the server (auto-update). My setup is pretty simple. Running 4.1.0.13 beta on an older i7 whitebox Win2016 server and using a 4 channel HDHomeRun (HDHR5-4US) tuner. Mostly a standard install. The attached logs (emby and last stream that shut down) are for a stoppage at 18:51:49. It is curious, at 18:51:48.872 I see the first stop entry with a 'q' command being sent to ffmpeg as if I had stopped the playback on my own. But I did not. I've checked the Windows Event logs to see if Windows captured anything. There aren't any entries around the time the stream stopped but I do see 2 critical alerts at roughly the same time each day (screenshots below). 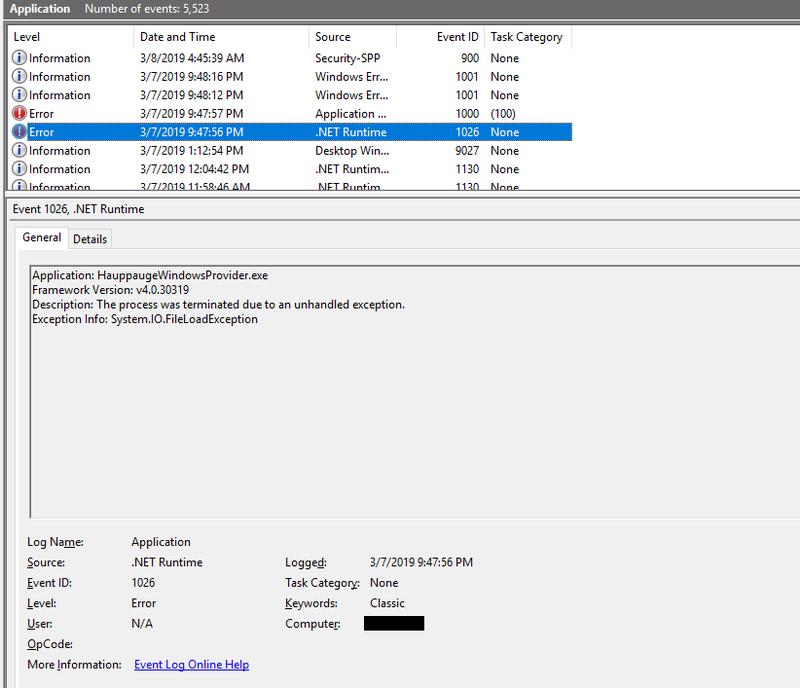 Hi, if you click on the details of that event viewer entry, what does it have there? This is confusing. You have Hauppauge software installed yet you said you are using an HDHomeRun which are different companies. Can you confirm exactly which tuner you are using? Cayars, I understand your confusion. I do not have any Hauppauge based tuners installed. Never have. This server was a clean install just for Emby and the only tuners I've used have been HDHomeRuns. Don't believe the error is related to the LiveTV streaming stoppage but included it to err on the side of being thorough. Luke, here are the details on the 2 recurring events. As I said, roughly once a day and not around the time the LiveTV streams stop. Edited by accarshop, 12 March 2019 - 04:40 PM. 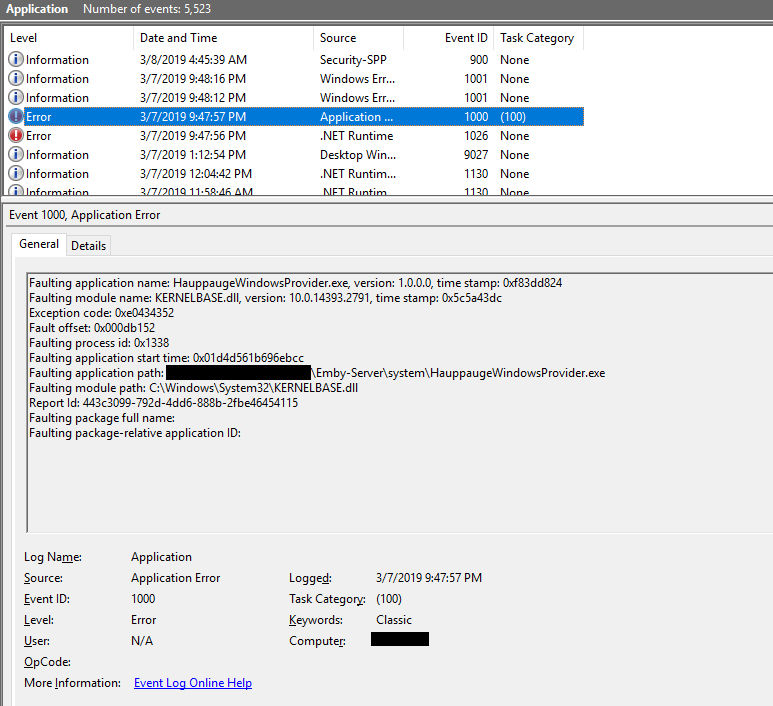 That event viewer entry is from discovery attempts to search for hauppauge, devices, for instance if you used the tuner detection when adding a tuner. It's nothing to worry about. Regarding streams stopping, since you're running the beta server, please continue to test new betas and report your results. thanks. I wondered if what I'm experiencing is the same as being reported by the IPTV users. From your answer, it sounds like it. Am letting the betas apply as they come in. Will report if I see a change in behavior. Incidentally, it persists in 4.1.0.14. Edited by accarshop, 13 March 2019 - 07:56 PM. As an update, things have improved after deploying v4.1.0.16 beta. Seeing occasional pauses in playback and it will still stop periodically but a fraction of what I saw before. Also seeing improvement in some of the recorded tv playback. I do hope for a bit more improvement but am happy with the progress and thank you for your efforts. I like Emby a LOT and anxious to see where the product goes in the future but there is a factor (one's spouse) that I think many of us have to consider when using Emby or any product. My wife just wants it to work. She doesn't want to have to work at being able to watch TV or a show/movie. Happy wife, happy life. Unhappy wife, well, lets leave that alone for now. For a bit now we've had challenges with Emby. As of version 4.1.0.25 beta live TV playback is back to stopping all the time and my wife has gotten frustrated to the point she isn't watching live TV now. On my PC I've taken to using Emby for the guide and then using VLC to stream the station I want directly from the HDHomeRun tuner. It works fine but isn't something my wife has the patience to do. If the live TV issue was the only problem happening I don't believe my wife would be as touchy but we are also seeing playback issues with any with anything that has DTS audio. This accounts for a lot of our content and I see others have commented about. On my server transcoding for DTS seems to outrun my server so we get momentary pauses (~10 sec) in the playback. It makes enjoying a show difficult. I've managed to reduce the frustration with transcoding by installing VLC on our Shield and setting Emby to use an external player. It isn't as clean or pretty but at least playback is consistent again. Any assistance on clearing this up will be GREATLY appreciated. Edited by accarshop, 18 April 2019 - 03:17 PM. Hi, can we please look at a new example with server & ffmpeg logs? thanks.